Peninsula School creates a space where children thrive and develop their full promise as confident contributors in the world. Here they learn about themselves and others, discovering their passions and growing intellectually in an inclusive community rich with choices, exploration, and play. 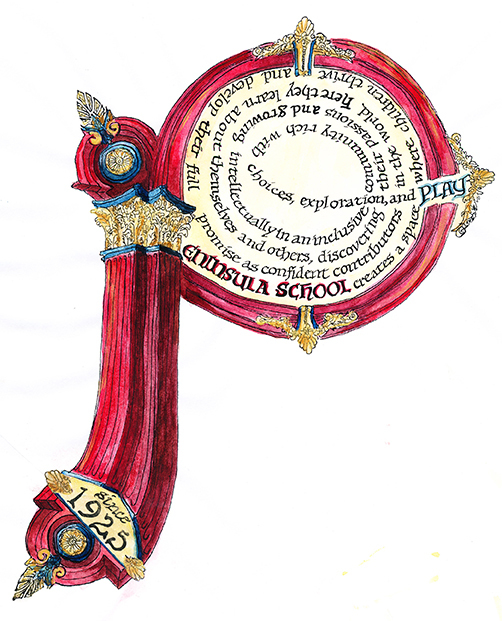 Through the progressive principles of constant reflection and renewal, Peninsula School will continue to adapt to the ever-changing world while holding true to the core values that have been the school’s foundation for nearly a century. We will articulate how our unique pedagogy fosters a learning community that nurtures intellectual curiosity and where students develop the skills and confidence necessary to become creative and compassionate contributors in the world. In the school’s ongoing quest for social justice, we will continue to champion diversity, equity, and inclusion by building a community rich with a range of experiences and perspectives. We will strive to provide our students, staff, and families with resources to thrive in our community. Peninsula School's core values are long-standing, deeply held, grounded in the Progressive Education tradition, and put into practice daily throughout our community. Children learn to communicate honestly and directly and to make decisions conscientiously. Children learn the value of personal connections and membership in a diverse community committed to local and global justice. Children are individuals; their differences are recognized, appreciated and honored in the classroom and school community. Children learn best by experiencing daily opportunities for making important choices and reflecting on the results. Children explore their world and develop strong critical thinking skills through a progressive teaching and learning program, with opportunities to discover, problem solve, and meet challenges. Children need ample time and space for safe, open-ended exploration in our richly varied environment. Each child is a unique individual whose intellectual, social, emotional, creative and physical self must be honored and nurtured. Time and space for making choices and for play are essential to children’s learning and development. Relevant and effective curriculum must include hands-on learning grounded in the arts and the natural world. Teachers need to have the freedom to develop excellent age-appropriate curriculum and to be authentic in their teaching styles. Providing an equitable and supportive environment for a diverse population is essential to an excellent education. We honor childhood, encouraging children to develop skills and mastery through age-appropriate, non-competitive, relationship-based learning. The Peninsula School community supports the school’s mission by modeling our core values through interactions across all age groups, with the larger community, and the world. "It is not a common school."